The text on this chic navy blue and white floral damask pink gerbera daisy recipe binder is fully customizable. Really, it can be used as any kind of binder. Some suggestions are a journal, a wedding album binder, a wedding planning binder, a school binder, etc. All you need to do is change the text. To change the text use the tools on the Zazzle website. This binder is the 1.5 inch size. Note, recipe card inserts and pages will need to be purchased separately. The binder does not include them. 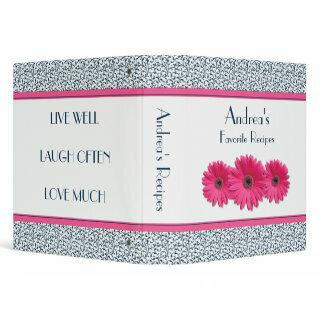 Zazzle's eye-catching Avery Custom Signature Binders are great for home or office. Zazzle's 3-Ring Avery binders are printed full-bleed using vibrant, full color, photo-quality printing on the front, back and spine. These customizable binders have 4 inside pockets and come in two different ring types. Two different rings available: holds 375 pages with EZ-Turn™ Rings or 400 pages with 1 Touch™ EZD™ Rings. Sized for 8.5" x 11" paper. Note: Binders do NOT include binder inserts. These need to be purchased separately. However, this is a standard 8.5" x 11" binder, so inserts are available in stores and online. Zazzle binders are printed and shipped in the US, even if ordered off of international sites. Please allow sufficient time for international shipping.